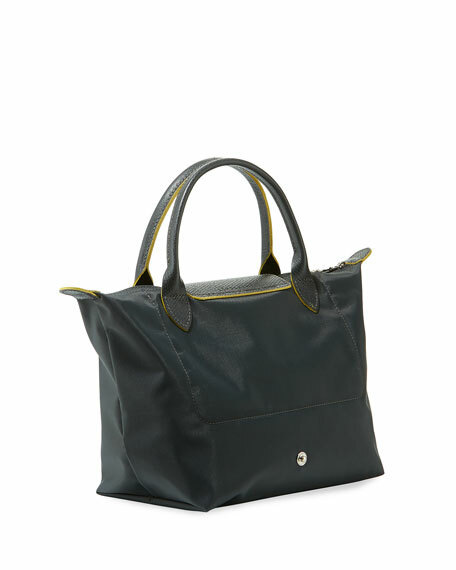 Longchamp tote bag in durable nylon/cotton canvas. Two short rolled top handles, 6" drop. Snap flap at center with race horse embossing. Exterior, embroidered racing horse at front. 8.8"H x 9"W x 5.5"D.
Brunello Cucinelli metallic calf leather tote bag with suede trim. Rolled top handles wrap around bag. 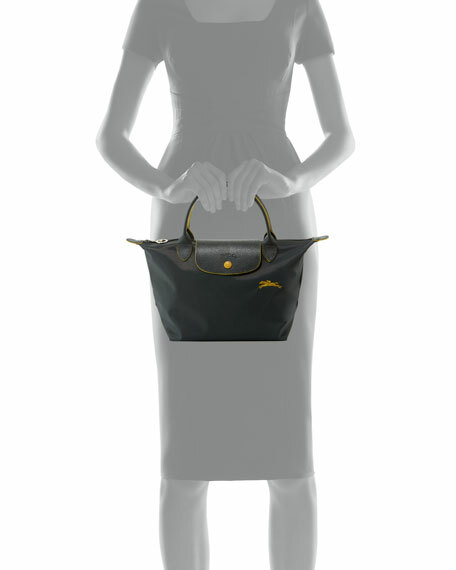 Removable shoulder strap, 23.6"
Brunello Cucinelli metallic calf leather tote bag with suede trim. Rolled top handles wrap around bag. Removable shoulder strap, 23.6" drop. Zip top closure with monili pull. 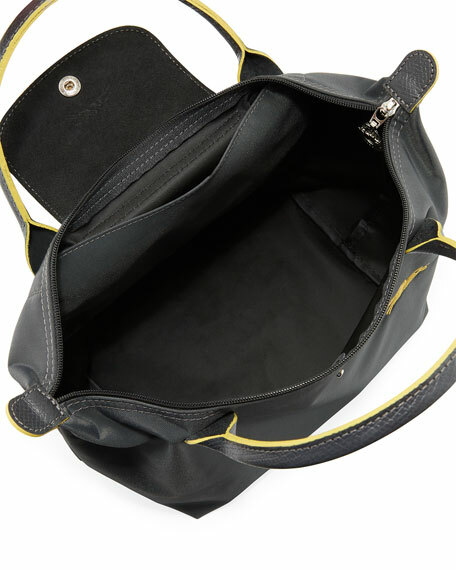 Interior, fabric lining; one zip pocket. Leashed metal logo tag. 15"H x 24.4"W x 7.9"D. Made in Italy. Christian Louboutin leather tote bag with spiked patent sides. Rolled top handles, 4" drop. Removable, adjustable shoulder strap, 20" drop. Christian Louboutin leather tote bag with spiked patent sides. Rolled top handles, 4" drop. Removable, adjustable shoulder strap, 20" drop. Open top with tab closure. Interior, one zip pocket. Signature red lining. Metal feet protect bottom. 9.3"H x 8.8"W x 5"D. "Paloma" is made in Italy.